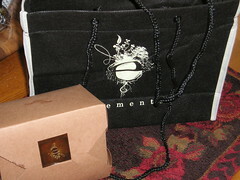 Check out this bag from elements restaurant in Princeton. When I could not finish my entrée there recently (delicious Griggstown chicken), manager Emilia Sparatta presented me with this take home bag that made my day (or evening). Soft woven “fabric,” piped edges, cord handles. You’d think I’d been to the toniest shop on Madison Avenue. My friend wished she hadn’t cleaned her plate! And, of course the little box that held the chicken is environmentally friendly, almost as friendly as the staff. Hospitality reaches new heights here, but the vibe is still relaxed.